EcoSynthetix is a renewable chemicals company specializing in bio-based materials that are used as inputs in a wide range of end products. Our commercial products are cost-competitive and exhibit similar performance characteristics compared to the non-renewable products they replace. Our sustainable products allow customers to reduce their use of harmful materials, such as formaldehyde and styrene-based chemicals. 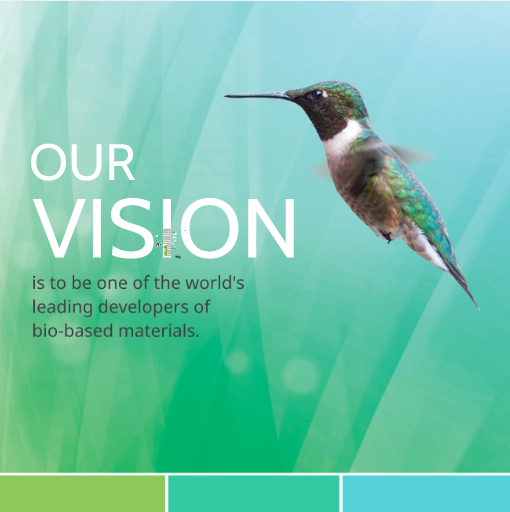 Our two flagship products are EcoSphere® biolatex® and DuraBindTM biopolymers. EcoSphere is in commercial use around the world in the paper and paperboard packaging industries. It is used to replace petroleum-based Styrene Butadiene (SB) latex binders, which are used to allow colourful graphics to "stick" to glossy paper used in magazines, books and packaging like cereal boxes. DuraBindTM biopolymers are a no added formaldehyde binder system used in the production of wood composite panels. EcoSynthetix is based in Burlington, Ontario and is publicly traded on the Toronto Stock Exchange (T:ECO).